Sankyo Flute is in pursuit of a transparent and clear tone as well as a rich sound which reverberates into the distance. 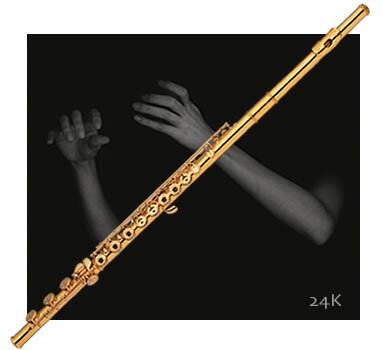 In an endless approach towards this ideal, the "24K Gold" flute can be said to be one completed form of achieving this ideal. Being the first in the world to develop a gold flute, Sankyo Flutes complete knowledge in "Gold" brought forth this ultimate model. filled with captivationg expressive power but yet so pure that barely any noise can be felt. The tone of this instrument together with its eminent glow continues to captivate flutists and audiences around world. with K14 or K18 gold posts, ribs and keys. Tubing 0.28 or 0.30 mm.